Andy Awford senses Pompey’s point at Cheltenham has provided his players with a timely Christmas confidence boost. The Blues came from behind through Nigel Atangana to draw 1-1 at Whaddon Road on Saturday. In doing so, they avoided a third straight loss following negative results against Tranmere and Accrington. 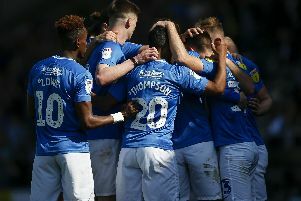 The relief at the final whistle among the players and Awford was noticeable, particularly as they also prevented a sixth consecutive away defeat. And tellingly in training since, Awford has witnessed a more upbeat atmosphere. He said: ‘We’d had two negative results and I remember losing the Newport game and then Burton followed by Southend and it really knocked us. ‘You don’t want to lose back-to-backs but we had – Tranmere and Accrington – so it was important we didn’t go through that again. ‘Any point away from home is a good point anyway, but to get the point in the circumstances we had was important and I think the level of performance has given the lads confidence. ‘I saw that in training on Monday. I also sensed in the dressing room afterwards they were pleased with what they had done because we asked them to play a specific way. ‘That is precisely what they did and it has given us a base to work from moving into the next two fixtures. ‘I can remember Cheltenham having two chances, with one the goal where we should have tidied up better on the edge of the box and he has managed to get it onto his left foot for a good finish. ‘The other was in the second half when Paul Jones has made a good save from an individual error. ‘We really restricted them and the defensive unit looks good on the whole, I am just disappointed we didn’t go and take all three points. ‘They have taken massive positives from the game. ‘After losing two matches in a row it was important whatever happened at Cheltenham that we didn’t get beat. ‘For me, we had to stop that, which we did. On Boxing Day, Pompey take on an AFC Wimbledon side level on points, although a position behind. Neal Ardley’s men have won their last two away fixtures, including victory at League Two leaders Wycombe.